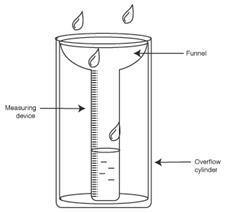 Explain the construction and functioning of the rain gauge. It consists of a metal cylinder, a funnel, a container and a graduated cylinder or a measuring jar. The container is placed inside the metal cylinder, and the funnel is placed over it. Water drops collect in the container through the funnel. The rain water collected is measured in the measuring jar.